There are so many dishes that we love in Thai Cuisine. Thai Green Curry is one of those. 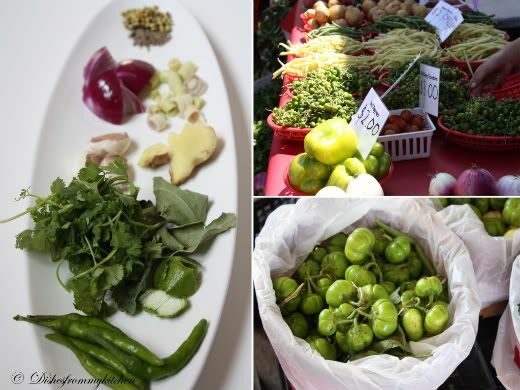 Basically all Thai dishes involves few common ingredients you can check the Ingredients here. The Kaffir lime leaves and Galangal is one of the Ingredients. But unfortunately these both are not available for me in near by markets. But anyway you can substitute the Galangal with ginger. Whenever Kaffir lime leaves are available in bulk dry and you can store in the refrigerator too, With that few rind of lemon gives the exact flavor to the curry. Some brief about the Pea Eggplant. 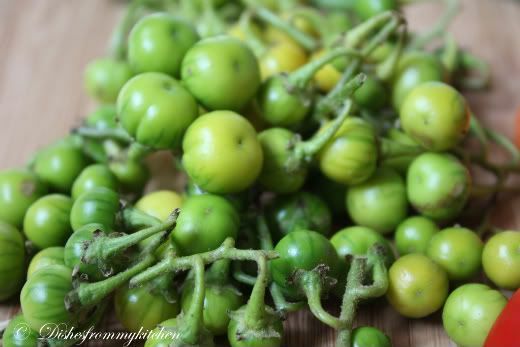 Pea Eggplant which is also called as Makheau Phuang, Bitter balls, Pea Aubergine which is also called as Sundaikkai. These tiny Thai eggplants are quite bitter. They're sold in clusters and look like large green peas. You can find them fresh in Thai markets. Very little of this is also added to Green Curry. But if you don't like the bitter taste, you can totally avoid them or can substitute with Thai Green Eggplants which is very very tasty too. Green Chilli - 3 or If bird's eye chilli you can substitute according to your spice level. 1. Toast dry seeds in the pan. 2. Powder them in the blender or mortar pestle. 3. Now add the remaining ingredients and make to fine paste. If you want to store them in the fridge, you can fry the paste in tbsp of oil, cool and store in air tight container. 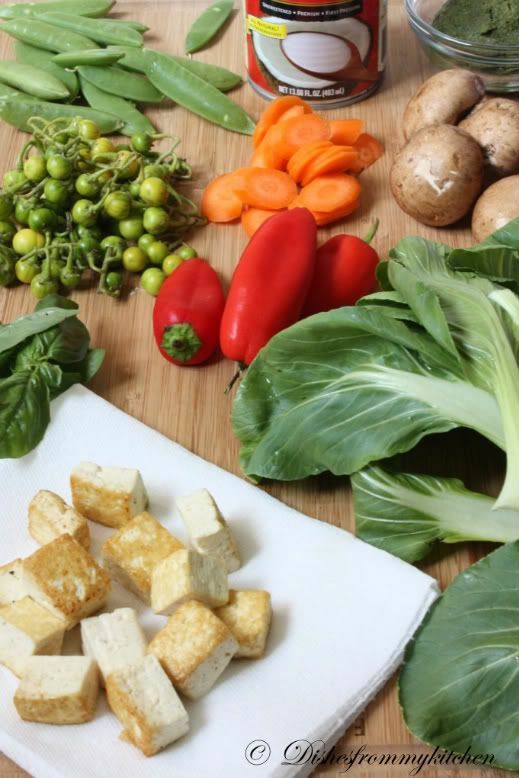 Vegetables that you can use for this Green Curry - Carrots, Red bell pepper, Bok Choy, Pea eggplant , Potato, Napa Cabbage, Zucchini, Bamboo shoots, Baby Corn, Green beans, Fried Tofu or Tofu Puff, Seitan(or you can substitute with chicken too), Snow pea, Mushrooms, Green Egg plant, Broccoli. 1. Heat tsp of oil in the pan, add the curry paste. 2. Saute for few minutes until it is nicely cooked. 3. Now add little coconut milk, mix well once it is nicely incorporate, add some more mix well. 4. Now add the remaining milk and add the veggies and lime leaves to it. 5. Once all the veggies are cooked( its important not to overcook the veggies). 6. Add the fresh Basil and serve with Thai jasmine rice!!!!!!!! 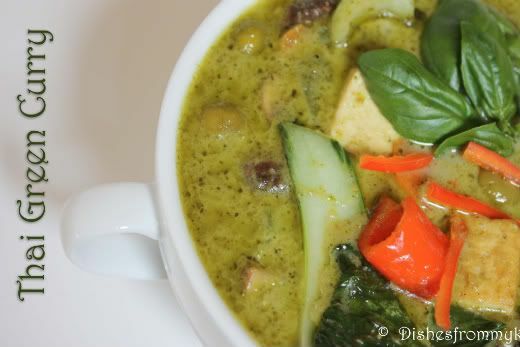 Thai Green curry with Fragrant Rice is truly Delicious and enjoy the exotic flavors !!!!! Its optional to fry the Tofu in the oil, you can add the cubed firm Tofu too. Add after all the veggies are cooked. curry looks yummy and thick...as usual nice click. I can imagine how delicous this curry is as it is mad ewith home made paste. looks so so yummy. 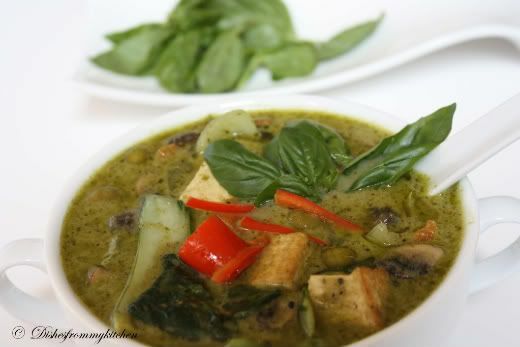 Nice green curry, look tempting and yummy. Lovely clicks Pavithra. Like the recipe. Hmmmm..I can smell the flavor right now dear......its looking very very tempting..
Hi. This is my all time favorite thai food, very well explained dear. Looks very authentic, lovely recipe. i love thai dishes too and i had tried this once and just loved it...yours too look yummy and perfectly presented as always..
Pavi - my most favorite eat out places here are Thai restaurants! Love the curries. Yours look super gorgeous. Kaalangarthala paakaren...in between drinking coffee - I'm still drooling! very interesting dear,luks delicious...pics are too gud. We ahd this for dinner on Sunday..My family fav Pavithra..Well done..
Looks very interesting & great effort.Super click too.Did't know that we get fresh sundaikai in USA. 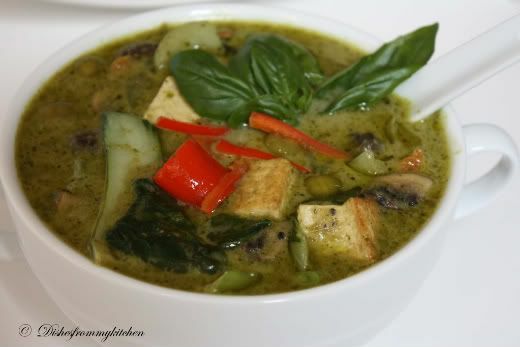 A very delicious green curry dish! 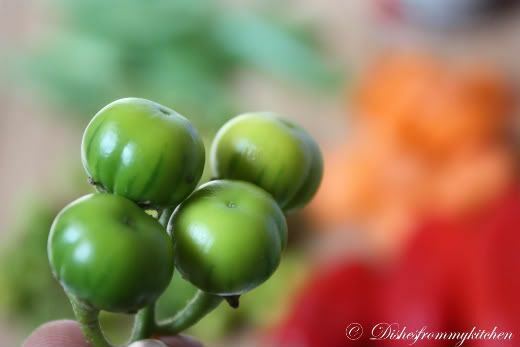 These green tomatoes are great! very beautiful clicks.. thanks for sharing !! wow, that curry looks amazing !!! I love thai curries and whoa, never heard about pea eggplant. Lovely !!! Lovely color dear...awesome clicks as usual ! Wow, this is new to me. Looks Yummy. Nice clicks. beautiful pictures and the recipe couldn't be better! Love it. If I am forced to adapt another cuisine instead of Indian food it is Thai. Looks absolutely delicious like the restaurant ones. Totally a new dish to me, but sounds delicious. Must be yummy. Great pics. Very colorful and inviting curry. Thai curry looks colourful, delicious and its very healthy. I appreciate for your wonderful presentation. 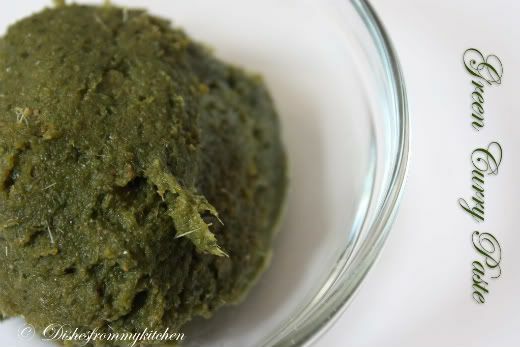 I always buy my green curry paste. Your recipe is mouthwatering. Oh anni... Did you make this thai dish because i asked for more thai dishes in your last post??? This is truly mouth watering anni.. I can imagine the taste of this recipe... Could you not have lived in chennai????????? yummy dish and lovely clicks! Such a lovely n inviting recipe ... love ur international cuisines !!! 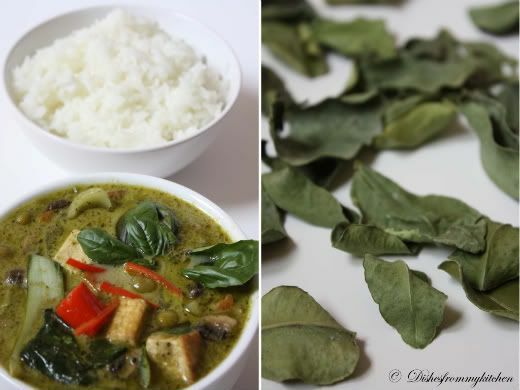 beautiful post with lovely clicks and great explanation too.., I made green curry and red curry as I couldn't get hold of the original ingredients I used them as powders and dried ones! I wish I could get them!! wow thats a delicioius green curry very beautiful pics.. so good one..
visited ur blog for the 1st time...u make them all look so yummy!!!! cheers!! hope to try and let you know how it all works out! 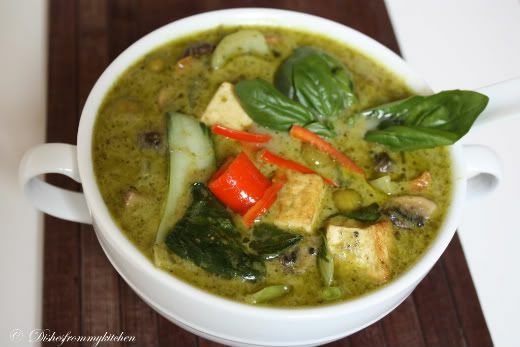 Your green curry looks so appetizing. It is making me crave for something spicy. i just love your blog.. recipes are exotic and yummy.. clicks are superb and tempting !! !